In order to get the most years out of your Honda and keep it in optimal shape, Holmes Honda suggests following the factory-recommended maintenance schedule. 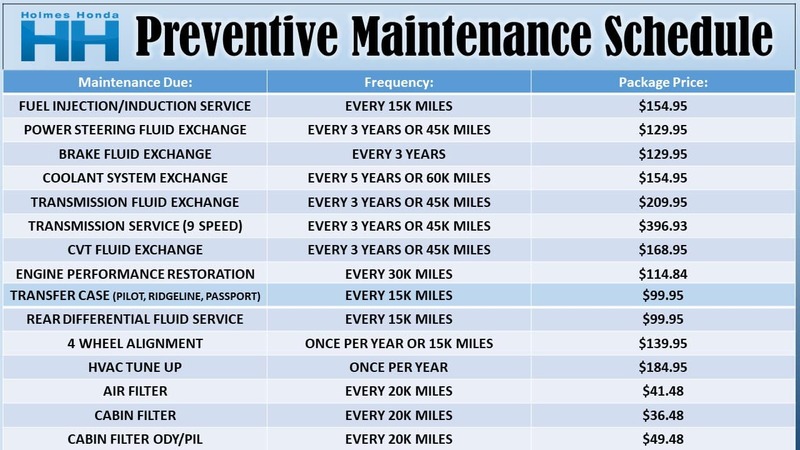 Performing the various maintenance items at the recommended time will help prevent problems before they occur, and will also help save your time and money! Following these schedules will help keep your manufacturers warranty intact for the life of the warranty and will help maintain a high resale value. When do you need Power Steering Fluid Exchange? What is Power Steering Fluid Exchange? Over time, your car’s power steering fluid gets contaminated with impurities that can cause premature wear and damage to your power steering system components. Exchanging old power steering fluidwith new, high-quality power steering fluid helps replenish and protect the components of your steering system. When do you need a Brake Fluid Exchange Service? What if I take care of it? What are the benefits of Honda Genuine Brake Fluid? What if I ignore the Coolant System Exchange? What are the benefits of Honda Genuine Engine Coolant? What is Automatic Transmission Fluid? Automatic Transmission Fluid provides hydraulic power to perform transmission functions, such as shifting gears. It also lubricates and cools internal components. Transmission fluid degrades and breaks down (wears out) with use, and poor fluid quality or condition can lead to shudder or harsh shifting. What are the benefits of Honda Genuine Automatic Transmission Fluid? What are the benefits of Honda Genuine ATF Type 3.1? HCF-2 Transmission Fluid is used specifically in Honda vehicles with second generation Continuously Variable Transmissions (CVT). Instead of using fixed gear ratios like in a conventional transmission, the CVT varies ratios continuously based on engine speed, vehicle speed, and other driving conditions. What are the benefits of Honda Genuine CVT Fluid (HCF-2)? Part of the Variable Torque Management 4WD System(VTM-4), the rear differential automatically varies the amount of torque distributed to each rear wheel based on demand. Rear Differential Fluid lubricates and cools the clutch packs inside the rear differential. What are the benefits of Honda Genuine Rear Differential (VTM-4) Fluid? Dual Pump II Fluid is used in the Real Time 4WD/AWD system for lubrication and to produce hydraulic pressure for transmitting force to the rear wheels when needed. What are the benefits of Honda Genuine Rear Differential Dual Pump II Fluid? How often do you need a wheel alignment? The cabin air filter, also called a dust and pollen filter, in the Heating, Ventilation and Air-Conditioning (HVAC) system helps keep pollen, dust and airborne contaminants out of your vehicles passenger cabin. It filters both incoming and circulated air. Why Honda Genuine Cabin Air (Dust and Pollen) Filters? Engines, like people, need to breathe clean air to stay fit. Installed in the air intake system, the engine air system removes dust and contaminants from incoming air before they can enter the engine. What are the benefits of Honda Genuine Engine Air Filters? Why service your vehicle at Holmes Honda? You will have piece-of-mind knowing that at Holmes Honda, only Technicians with extensive training and factory accreditations will work on your vehicle. We will only replace worn or defective parts with Genuine Honda Parts that meet Honda Motor Company stringent requirements, and we warranty and stand behind our work. Take advantage of our mobile friendly web site to schedule your reservation, or feel free to call in and allow one of our reservationist to set it for you. When arriving you will be greeted by a Factory Trained Service Advisor ready to serve you. Your vehicle information and reason for visit will be quickly uploaded into a mobile tablet, and a quick walk-around of your vehicle will be performed. Your vehicle will receive a complimentary multi-point safety inspection each time it comes in. Your service advisor will review the results of the inspection each time, so you are kept informed of maintenance and repairs needed now and in the future. If your taking advantage of our Express Service, you may choose to hang out in our Ultra Comfortable waiting room. We offer a Super Clean Environment, with comfortable chairs, multiple TV’s for your viewing pleasure, reading material, computers to surf the web, and complimentary coffee, water, soda, and snacks! At the completion of your visit you will receive a voucher to use our car wash at your leisure. For your convenience we accept most forms of payment, including Visa, Mastercard,and American Express. We also have available zero interest up to 6 months with a minimum purchase of $200.00 with approved credit. To take advantage of a current service offer, click here to view. Come visit us at Holmes Honda Bossier City, located at 1040 Innovation Drive in Bossier City, LA! For more information, please feel free to give us a call at 318-963-5669 or take advantage of our online service scheduler! We look forward to hearing from you! Holmes Honda also has an array of Service Specials to offer our customers! Some of these include oil change coupons, auto butler coupons, executive detail coupons, wheel alignment coupons as well as parts and accessory specials!